Save yourself the frustration of waiting endlessly for files to be copied – get the Kogan USB 3.0 Flash Drive with super fast read and write speeds. 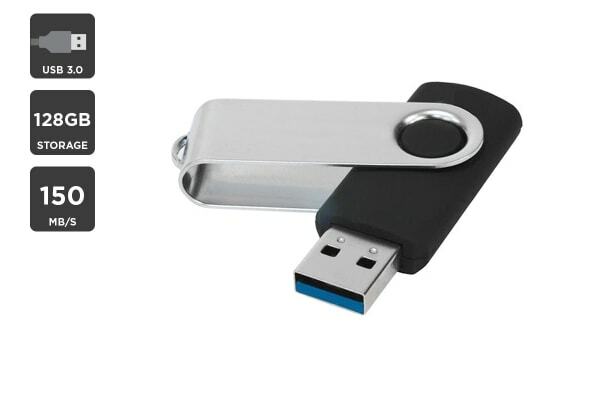 With the huge storage capacity of the Kogan 128GB USB 3.0 Flash Drive, you can maintain a full archive of your most important and most used files. Its built-in ECC and bad block management prevents data loss and keeps it safe and secure, so you can store your collection of videos, photos and music as well as your work-related documents and carry them along with you wherever you wish! USB 3.0 allows up to 10 times the transfer rate of USB 2.0 when used with compatible devices. You’ll spend less time waiting for your data to be copied or saved, so you can stream videos, download music and backup your data quicker than ever. I like the product, would bebetter if the storage size was printed on its cover like most usb sticks.